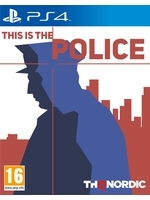 Successfully funded last year on Kickstarter the "moral choice strategy adventure game" This Is the Police gets a new story trailer and the studio announced the title will hit PC this Summer with console versions soon after. You take on the role of Jack Boyd, honest chief of Police for decades, who will be compulsorily retired in 6 months. Your goal is to get $500.000 in your bank account whether you use bribery, cooperation with the Mafia, selling seized weapons, it's up to you. Great to see such an original idea!